The text below, originally published in a now long out of print booklet, was written to commemorate the centenary of Honley Socialist Club in 1992. Since then, new material, including a biography of one of the local Socialist pioneers, France Littlewood, has been gathered, and awaits incorporation into a revised account. Honley’s long tradition of Radical politics stems from the years around 1800, as handloom weavers, croppers and other artisans resisted the economic and social changes forced on them by industrialisation and an undemocratic political system that safeguarded the interests of the rising class of wealthy manufacturers. In these struggles, a dynamic popular culture of resistance was created with alternative ideals, values, aspirations and forms of organisation. There are strong hints of republican “Jacobin” activity in the township during the period of the French revolution, when Corresponding Societies and the more militant United Englishmen certainly had a presence in Almondbury and Huddersfield. In 1812, although several Luddite attacks were carried out, no local croppers were prosecuted, but, in 1817, following the attempted Radical uprising, a number of Honley croppers and weavers were charged and one prominent leader, George Taylor, ‘the Honley huntsman’s son’, went on the run. Honley was one of the first townships after Almondbury to establish a radical Political Union for parliamentary reform in the 1830s, and there was support for the Republican politics of Richard Carlile. 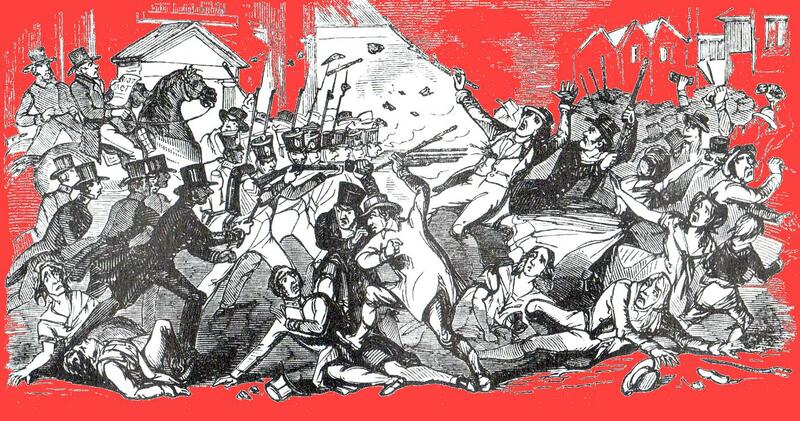 Struggles for the free press, for factory reform and against the New Poor Law all had local adherents, whose efforts culminated in the formation of a Chartist Northern Union in 1838. This same year, Owenite Socialists rented their own meeting room in a cottage cellar at Berry Croft. Constituted as Class 19, they were a satellite of the No.6 Branch of the Association of All Classes of All Nations in Huddersfield which, in 1839, built a palatial Hall of Science in the town. The New Moral World, the Socialists’ journal, reported of Honley in 1844 ‘The cause of rationalism is progressing very well in this locality’ – but, in reality, the cause was past its zenith. The heirs of the Owenite tradition of philosophical materialism, the Secularists, still had some support up to 1861 and Joseph Jaggar of Honley Moor Bottom was a prominent figure in the movement in Yorkshire and Lancashire. There was in Honley many years ago and still is, a room which was known to the inhabitants as “Th’ Garrit” … a Cave of Abdullam, where gathered the originals of the district, whether cobblers, given then as now somewhat to freethinking in matters religious, or radicals, admirers of Robert Owen, who found the atmosphere of the National Schools too close and stuffy, or, on occassion, lads and lasses who wanted to dance and romp at Christmas time,but could not, as their betters, meet at each others’ houses for this not very dreadful purpose … The phrase “He goes to th’Garrit” thus became one of reproach in the mouths of good Church-going villagers who could not write their own names and did not want to, but one of a certain half mischievous and impish commendation in those of men who cared little for the opinions of “the stick-in-the-muds”, and a great deal for the education of their children and the “Rights of Man” … Weavers, farmers, dyers, all who were not quite agreed that the world as it ran was the best world that could be, met to devise improvements and point out where and what remedies might be made. In fact, real wages in the textile industry at this time are difficult to calculate, since workers in different departments working on different goods had widely varying rates. Also, the fluctuating state of trade affected real wages. In the 1890s, local textiles were slightly depressed, recovering up to 1907, followed by a slump in 1908, before reviving steadily up to the World War, which meant a boom for firms involved in military contracts. Workers in Honley therefore did not suffer the extreme poverty or widespread employment experienced in some other areas. Their Socialism was not motivated by acute material distress. But their need to constantly defend working conditions made struggle on the trade union’s industrial front an important element in their concept of Socialism. 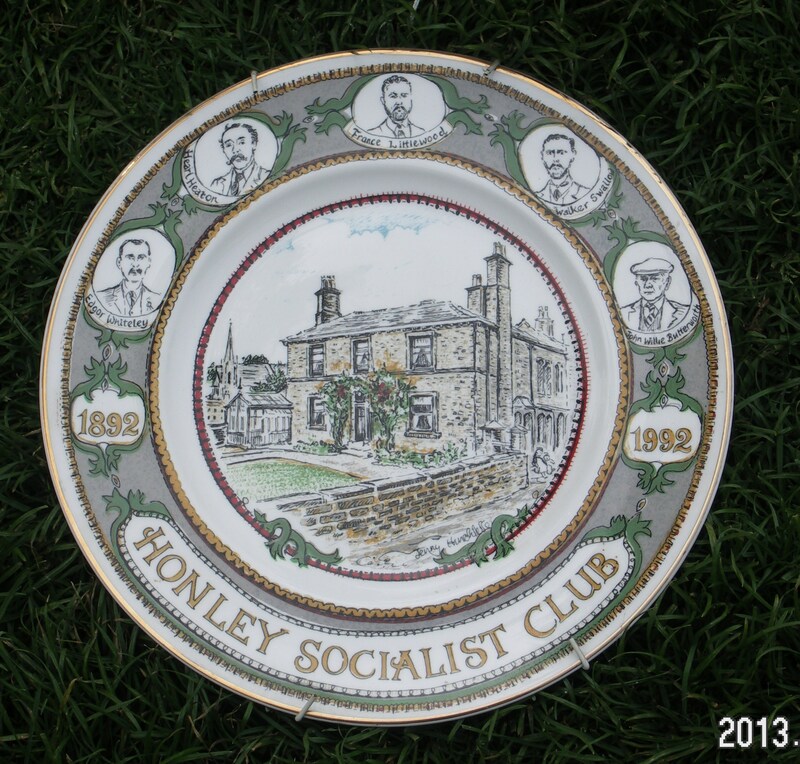 THE BIRTH OF HONLEY LABOUR CLUB 1891-1892. TOM MANN AND TRADE UNIONISM 1892-1894. Tom Mann was made a honorary member of the Labour Club, and his election campaign was energetically supported. It was fought on the basis of the ILP programme – an 8 hour day, relief work for the unemployed, state pensions for all over 50, payment of MPs etc. He collected over 1200 votes, about 13% of the poll, coming third place. Although this was a respectable result for the first Labour candidate in a strong Liberal seat, it must have come as an anti-climax to many of Mann’s supporters. As well as the election set-back, the close of the nineteenth century in a blaze of nationalism was not a very congenial climate for Socialists. In 1887 there was Victoria’s jubilee, followed by her death in 1901, and an upsurge of patriotism resulting from the Boer War. All these provided the loyalists of Honley as elsewhere with the excuse for jingoistic ceremonies. Even Tom Mann left the country, becoming a trade union organiser in Australia. Mainly as a consequence of the legal assault on trade unions marked by the Taff Vale judgement (which made unions liable for losses incurred by an employer during a strike), the Labour Representation Committee was formed in 1900. Its purpose was to organise trade unions, cooperative and socialist bodies to return candidates which would look after their interests in parliament. Twenty-nine such MPs were elected in 1906 on a Labour ticket, but in some areas this had meant coming to an agreement with the Liberals. This ‘Lib-Lab pact’ continued in parliament with the Labour Party, as it was now known, being careful not to antagonise the Liberals. The “Labour Party “at this time was therefore only the same as today’s Parliamentary Labour Party. In the country, it did not exist as a single organisation, but drew its support from a coalition of trade unions, co-operative and socialist bodies – particularly the ILP. This distinction between the Labour Party’s parliamentary liberalism and the aspirations of the grass-roots socialists was to be a source of conflict within the CVLL and consequently the ILP as a whole. CVLL was not ready to fight the 1906 election, but it participated in the wave of enthusiasm. 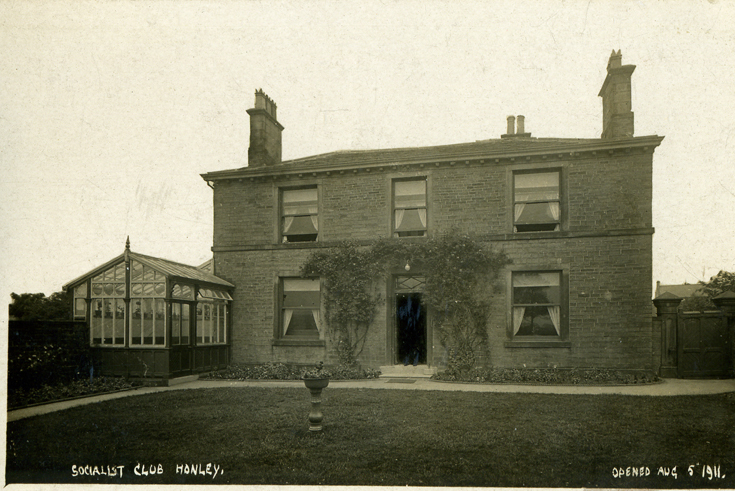 Honley Club increased rapidly from 13 members in 1905 to 79 in July 1906, when entries resume in the membership book. By the following year there were 185. Honley Labour Club’s membership was now so large that a new home was needed. Formerly, they had met in a room near Honley Bridge where the council offices now stand. On 31st August 1907, a new club was opened at New Street in an old handloom weavers type house. As celebrations play an important part in the Socialist movement of this time, it is worth describing the opening of the club premises in some detail, as ceremonies typical of similar events or Mayday parades. At 2.30 p.m. in the afternoon, the procession left the tram terminus at Honley Bridge, headed by about 40 Clarion cyclists, followed by Honley Brass Band and then 300 children wearing red rosettes and ribbons, and the girls with red sashes over their white frocks. The landau carrying Philip Snowden MP and his wife, Victor Grayson MP and Mrs France Littlewood led the rest of the demonstration, composed of Socialists from all over the Colne Valley. Proceedings were delayed a while as the Khyber Pass, the alley leading to New Street, was blocked by the throng. 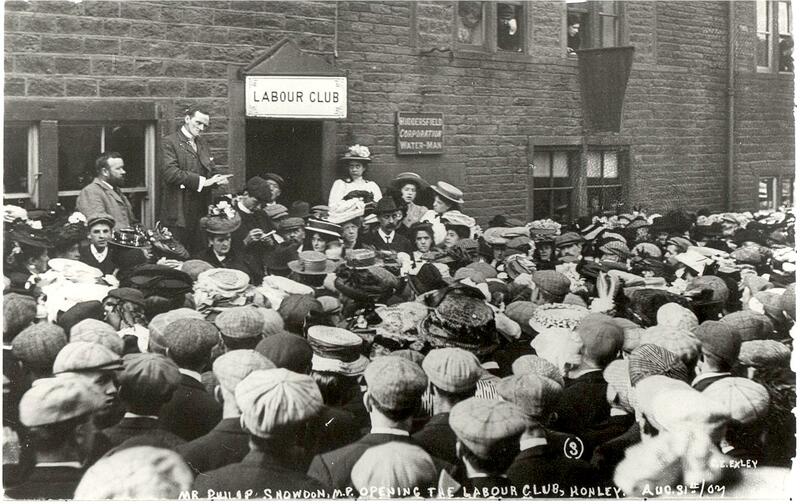 Honley Labour Club, opening of new premises 1907. Philip Snowden is speaking and France Littlewood is to his right. For members, the Club was the focus of their social, cultural and educational life. It was never merely the headquarters of a political party, for it provided all the shared experiences of ceremonies as well as shared beliefs and values, that bind people together in a community. The Club building played the same role as the meeting house of a religious community – a community whose religion was Socialism. It offered a protective togetherness to those who rejected the established ideas of capitalist society. Its strength lay in the ability to involve all sections of the working class community in a wide range of political and social activities. As in church or chapel, no ceremony or social was complete without music and singing. Honley, or sometimes Meltham Mills, Brass Band provided the music at several Socialist demonstrations and on the Mayday march into Huddersfield. However at Honley Socialist Club’s New Year tea in 1909, the newly formed Milnsbridge Socialist Brass Band entertained, giving a rousing rendition of England Arise in front of the Liberal Club and then marching off to the Marseillaise. Honley Socialist Choir also made its first appearance conducted by W.A. Burhouse (also a noted soloist). As well as performing at Club functions, this sang at Huddersfield ILP rooms under France Littlewood (1912) and won the choir prize at Honley carnival (1914). THE SPLIT FROM THE ILP 1908-1910. Despite the apparent harmony between Grayson and Philip Snowden at the opening of the Club in 1907, relations between the new MP and the Labour Party were already strained. Victor had already declined to sign the LP constitution and accept its discipline. Snowden had initially refused to speak at the Honley opening if Victor was present, on the basis of distorted press accounts of Victor inciting strikers in Belfast to fight back against troops. They needed no inciting to resist – he only asserted their right to do so. In parliament, Victor was not impressed by the etiquette and ridiculous conventions. His patience wore thin as irrelevant subjects were discussed, while the question of the unemployed was ignored. In 1908, he embarked on a campaign of disruption to force a debate on unemployment, resulting in his suspension from the Commons. The LP refused to back him up, but the CVLL commended him on his stand. The 1908 ILP conference held in Huddersfield was dominated by the dispute over why Victor had not been endorsed by the NAC of the party in the first place. Underlying this was growing disillusionment over the readiness of ILP MPs like Snowden and Macdonald to tone down their Socialism in parliament. In 1910 the CVSL council decided not to send any delegate to the ILP conference, although a minority thought they should try to influence the ILP ‘to return to a better way of life.’ France Littlewood wrote to the Worker in April strongly condemning the views of those who wished to secede from the ILP. He accused the ‘clean Socialists’ of ‘virulent sectarianism’ and ridiculed their strategy: ‘Parliament is of no use, Socialism can only come by preaching, by shouting and making oneself a general nuisance’. On 4th August 1911 an article by Victor appeared in the Clarion entitled, ‘The British Socialist Party – Who is ready ?’ As the LP had irrevocably drifted back into Liberalism, there was a need for a genuine Socialist party uniting the marxist SDP and the various other Socialist groups and ‘any organisation which is desirous of making Socialists’. NEW CLUB OPENING AT ENFIELD 1911. Socialist Club at Enfield House, Jaggar Lane, Honley. 1911 (Thanks to Peter Marshall and Honley Civic Society for this illustration). 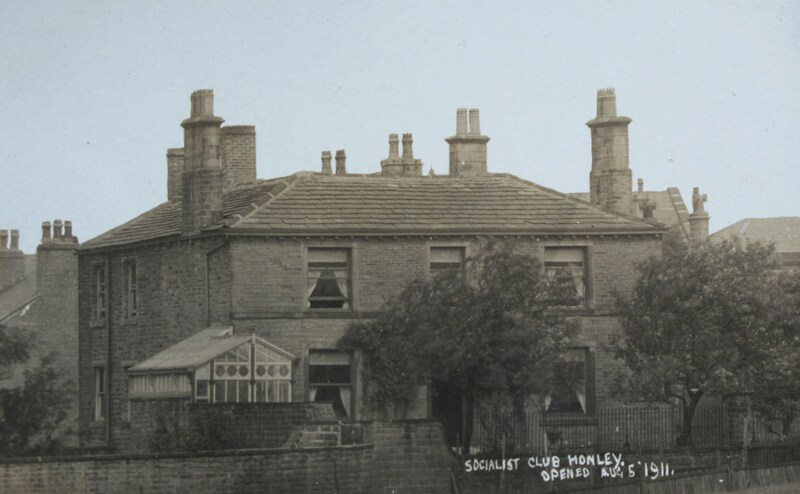 The controversy over secession from the ILP and the loss of Victor’s seat cost the Honley Club some members, falling from 201 in 1909 to 159 in 1910, although it was still in a thriving state. Negotiations for the purchase of Enfield House on Jaggar Lane were completed in November 1910 before the expiry of the lease on the New Street premises the following April. The property, formerly the residence of Lupton Littlewood, a woollen manufacturer, was bought for £640 raised by loans and subscriptions from 100 shareholders. It comprised two cottages and gardens covering 1089 square yards. About £200 worth of voluntary labour was expended by members to convert it to Club purposes, under the direction of a garden committee and a decoration commitee. Two gardens, a greenhouse, a summer house and a conservatory were refurbished or built. Joiners and decorators made a billiard room in the basement, a ground floor smoke room, ladies sewing room, committee room and steward’s living room, bar and scullery. A reading room, a concert room, card room, box room and steward’s bedroom and bathroom were provided upstairs. Electricity lit the premises and hot water was provided by gas. Members could have a bath for 2d. On 15th April the completion of the ‘flitting’ from the old Club was celebrated by a members tea and, a fortnight later, an ‘at home’ with singing and supper was held by the female members in aid of the sewing fund. Goods made by the women were intended for sale at the Christmas bazaar, when it was hoped that much of the debt for the new Club would be paid off. £400 had been provided by members and £200 raised by functions, leaving another £200 to be found. T.T. Hirst designed a fund level indicator in the shape of a monkey climbing a tree to reach the target total of £800. The official opening of the Club on 5th August, despite a rainy start, was well attended, with the procession led by Milnsbridge Socialist Brass Band. Tea was provided at Moorbottom School for 600 adults and 160 children. In the evening, a meeting and gala was held in the field next to the Club with games such as throwing three balls for a penny at a cut-out of Lloyd George. France Littlewood was not present at the festivities. He sent his best wishes but was holidaying at the seaside. It seems strange that he should miss such an important event for the Club, and we may conclude that it was intended to disassociate himself from Victor and the brand of revolutionary Socialism expressed in the speeches. Originally a member of the marxist SDF, being the London Woodgreen branch delegate to conference in 1904, Allen joined a faction which broke away to form the Socialist Party of Great Britain. In 1906, having failed to commit the SPGB to support for industrial struggles, he joined the British Advocates of Industrial Unionism established by the Socialist Labour Party, editing the Industrial Unionist. Industrial Unionists, or syndicalists, believed that the only front of the class struggle which really counted was in industry. They aimed to organise industrial unions uniting all trades, launch a general strike and take over the mines, railways and other means of production to establish a Socialist cooperative commonwealth run by workers themselves. Making a stand against war fever required principle and determination. Club membership fell from 128 in 1914 to 100 in 1915 and remained at that level throughout the war. Some financial difficulty may have been experienced, as Honley was late with its half-yearly contribution to the CVSL in 1915. A number of names appear in the membership book underlined and with no subs recorded for the duration of the war. Some like Arthur Hirst were conscientious objectors – others may have been conscripts who, reluctantly or not, reported to the colours. Membership fluctuated throughout this period. Rising from a wartime level of 100 to 141 in 1919, coinciding with the crest of a revolutionary wave, numbers lapsed to 102 in 1921. A revival is apparent in 1923, with 136 members, and in 1924, the year of the first Labour government, a new peak of 155 was reached. In the year of the general strike, there were 21 resignations, leaving only 119 entries in 1927 when the first membership book closes. Veterans like Arthur Curnock, John Whithead and B.A. Noble continued to be actively involved, as well as former conscientious objectors like Fred Swallow, Francis Sowerby and Beaumont Sykes. With men such as these at the helm, the delayed affiliation to the LP is understandable. They had devoted much of their lives to fighting Labourism. 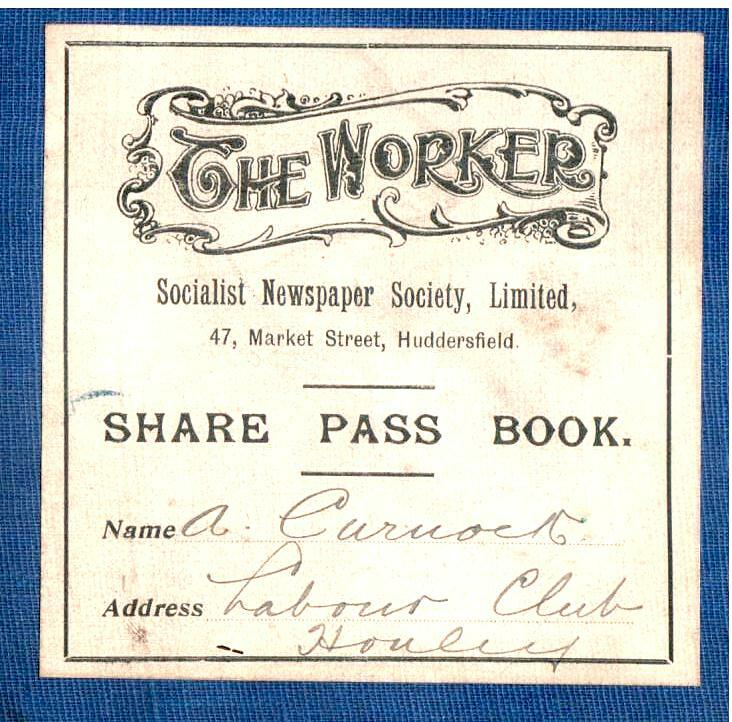 The opening inscription on Honley Socialist Club’s first membership book. Receding hopes of revolution, and the failure of the CP to make a breakthrough in Britain, combined with the growth of the LP as a parliamentary force, persuaded many Socialists to throw in their lot with the latter. As an organisation which revolved around elections, there was a corresponding decline in Socialist zeal. The Socialist rank and file decreasingly felt that they were participating in the political birth of a new society. Politics became something people periodically voted someone else in to do for them. The TUC sabotage of the General Strike, and the isolation of the miners, demoralised those whose faith lay in the ability of workers to wage the class struggle. The Labour government’s anti-working class policies in 1929, and the defection of Colne Valley MP, Philip Snowden in 1931 led to further disillusionment. Activity moved from the realm of community life to that of a soulless bureaucratic machine, and the Socialist Clubs, built up painstakingly, with so much energy, time and money invested lovingly towards the advance of humanity, declined into mainly social clubs. A culture of resistance and of vision was transformed into a culture of deference and acceptance of capitalism. 1. Honley Rental 1838, West Yorkshire Archive Service, Kirklees, (Thanks to librarian Lesley Kipling for this reference); New Moral World 27th April 1844; Edward Royle Victorian Infidels p.296, 228, 249.; Huddersfield Weekly Examiner 24th March 1883. 2. Victoria County History of Yorkshire Abstracts of Census figures. Worker 3rd July 1915. 3. Yorkshire Factory Times (YFT) 19th July, 6th December 1889; 15th March 1895. 4. YFT 30th March, 6th April 1894; 3rd May 1895, 30th May, 20th June, 14th November 1902; 27th April 1906; 3rd January, 17th October 1908. 5. YFT 25th July 1912. 6. Colne Valley Labour Union (CVLU) Vol 1. Minutes 21st July. YFT 9th October, 4th December 1891.; David Clark Colne Valley: Radicalism to Socialism (Longmans 1981) for overview of CVLU. 7. CVLU 1 Minutes 15th September, 10th November, 17th November 1891.YFT 9th October 1891; Four Honley members appear in the 1892 January entry of the subs book, Ben Jaggar, James Sykes, Fred Jubb, B. Littlewood and W. Swallow. 8. YFT 4th December 1891. 9. CVLU minutes 27th August, 3rd December 1892,YFT 16th December 1892. 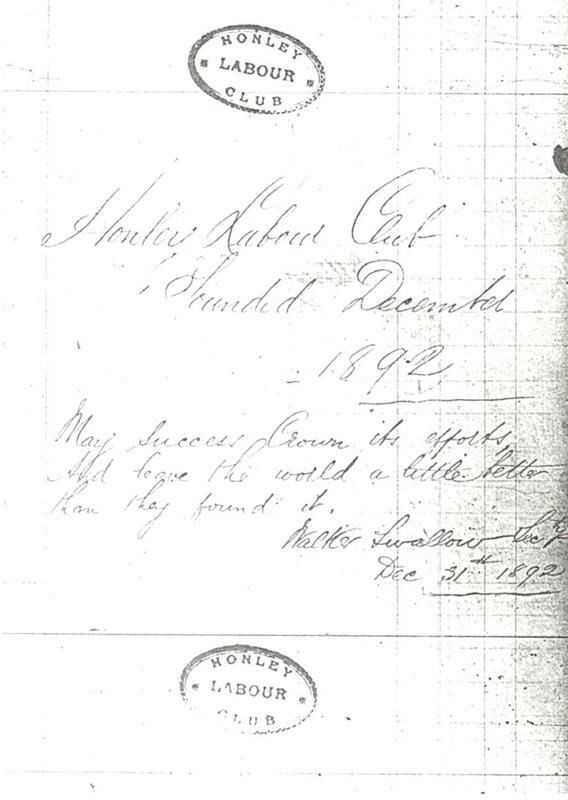 Membership book 1892-1895 , in possession of Mr Lewis Walker secretary of Honley Socialist Club. YFT 21st April 1893. 10. CVLU 1 Minutes 7th May 1892, 18th March, 11th November, 9th December 1893; David Howell British Workers and the Independent Labour Party 188-1906 (Manchester 1983) p.309, p.320 and for an analysis of the development of the ILP nationally; Huddersfield Weekly Examiner 4th February, Littlewood got 36 votes to Briggs’ 46, the Tory only 5; 14th January 1893, letter from Littlewood, following week was a reply from “One of old gang” on the Local Board. 11. Tom Mann, Memoirs 1923; YFT 16th December 1892; CVLU 1 minutes 24th June, 1st July 1893; YFT 21st July 1893. 12. Clark, op.cit. Ch.4 passim; CVLU 1 minutes 27th August, 3rd December 1892; YFT 13th April 1894, a trade unionist at Honley Mill victimised; 2nd May 1890, Mytholmbridge Mill dispute. 13. YFT 2nd June; 11th August; 1st December; 1893; 6th April 1894; 25th April 1890; YFT 15th March 1895, The Club member may have been the warper Tom Winterbottom who lived at Grove Houses. An accident involving his son, who was kicked by a horse and died is reported YFT 4th July 1902.; YFT 24th October 1908, Sykes; YFT 21st April 1893. 14. CVLU 1 minutes 20th March 1894. 16. CVLU minutes, 26th February, 20th May, 3rd December 1898; HSC mb; CVLU.1 minutes. 18. The Worker (W), appeared on 21 Jul 1905; W 1 Jun 1912. 19. W 16 Feb 1907; 6 Jul 1907, W 26 Jul 1907. 20. W 26 Jul 1907. 21. W 7 Sep 1907. 22. Mary Jaggar The History of Honley (Honley 1914) p.263.The Club is dealt with in less than 15 lines in which the opening of the New Street Club premises in 1907 is confused with the relocation at Enfield House in 1911; Non Club member Socialists include for example Mark Brooke, a conscientious objector in the war, who resigned in 1896 but whose brothers Hamlet and Havelock remained members. 23. W 1 Jan 1909; 5 May 1911; 28 Dec 1907. 24. W 15 Dec 1906,6 Jul 1907. Sylvia Pankhurst refers to the Womens’ Social and Political Union being ‘much in evidence’ in the election, but that once in parliament, Grayson ‘forgot all about the WSPU’. The Suffragette Movement. (Virago 1977) p.367. 25. W 4 Jul 1908, 26 Jun 1909. France Littlewood also went on record as saying ‘Women could make more Socialists than any man. They won the last Colne Valley election and he wanted them to make the next victory bigger.’ W 9 Jan 1909. 26. YFT 14 Mar 1890, a weavers’ meeting at Holmfirth expressed this view of women; W 3 Apr 1909. 28. W 2 May 1910. 30. W 20 Feb 1909, Milnsbridge Socialist Brass Band, W 26 Jun 1909 at Honley; W 20 Jan 1912 at ILP rooms; W 1 Aug 1914, Honley Carnival. 31. W 7 Sep 1909, Arthur Curnock’s report, also a discussion class was held on Sunday morning and a library was being formed; lectures include: W 29 Dec 1906 Littlewood, W 5 Jan 1907 Cllr G.A. Glyde of Bradford, W 19 Jan 1907 Edward Black, W 20 Dec 1907 R. Morley of Halifax, W. Gee of Northampton. 32. Clark op.cit p 78. 33. W 30 May 1908; W 16 Jan 1909; W 9 Jan 1909, 18 Jan 1909, for Oldham’s reply; W 9 Apr 1909; 23 Jul 1910; 7 Jun 1911. 35. CVSL 2 minutes, 17 Apr, 15 May 1909; Holmfirth Express 1 Jan 1910. 36. W 6 Feb 1909. 37. W 28 Feb 1910; W 23 Apr 1910. 38. W 30 Apr 1910; W 28 May 1910. 39. W 7 May 1910. 40. CVSL 3.minutes 17 Sep 1910. 41. W 12 Aug 1911. For the background to this movement see Keith Laybourn,’A Story of Buried talents and Wasted Opportunities’: The Failure of the Socialist Unity Movement in Yorkshire, 1911-1914′ Journal of Regional and Local Studies Vol 7 No.2 August 1987. 43. John Quail The Slow Burning Fuse: The Lost History of the British Anarchists (Granada 1978) p.252. ; Raymond Challinor, The Origins of British Bolshevism (Croom Helm 1977), pp 52-58,84, 89, 90-98, 106, 113; Bob Holton, British Syndicalism (Pluto 1976) pp.43-45, 55, 62, 68; W 9 Oct 1909. 44. W 22 Feb, 29 Feb 1909, Greensmith also had a letter on the subject in the Worker 7 Mar 1908. 46. Industrial Syndicalist (Spokesman Books Reprint 1974); W 6 Aug 1910..
47. W 25 Jun 1910; Industrial Syndicalist Nov 1910. 48. W 11 May 1912,13 Jun 1912; CVSL 3 minutes 27 Jul, acceptance of Allen’s resignation. 49. CVSL 3 minutes,3 Sep 1911, 20 Apr 1912; W 18 Oct 1913. 50. CVSL 3 minutes,13 Apr, 16 Aug 1913, 3 Jan 1914. 51. W 17 Jan 1914. 52. W 28 Nov 1914;19 Dec 1914. 53. Cyril Pearce “The Anti-war Movement in Huddersfield.” unpublished MPhil thesis, (Huddersfield Polytechnic 1988), for more background. Also, since this account of Honley SC was first written, C Pearce’s ‘Comrades in Conscience’, partly based on the thesis, has run to two editions, 2001 and 2014. Honley COs have been celebrated in the splendidly illustrated booklet ‘Honley in the Great War’, by Cyril Ford and Honley Civic Society 2014.France Littlewood was involved in the Huddersfield Workers’ Own Recruiting Committee. 54. W 4 Mar 1916, 11 Mar 1916. 55. W 1 Apr 1916;15 July 1916; 30 Sep 1916, Fred Swallow.F H Sowerby, according to his obituary in 1935 (HEW 1 Jan) spent 6 months in Durham Gaol. 56. W 1 Apr 1916; 15 Jul 1916; Interview with Mr Hampshire at 22 Burhouse Court, Honley 26 Sept 1983. 57. W 29 Apr 1916,29 Aug 1916; CVSL minutes 8 Apr 1916;W 2 Sep 1916; W 23 Sep 1916, 20 Jan 1917. 58. CVSL minutes 27 Sep 1914, executive rejects motion approving BSP affiliation to LP; ibid. 20 Jan 1917,W 27 Jan 1917;3 Nov 1917. 59. Honley Socialist Club (HSC), committee minute book, 21 Jan 1917; W 8 Sep, 15 Sep, 8 Oct, 3 Nov 1917; letters from Schofield,17 Nov, Shaw’s reply, CVSL minutes, 20 Oct, John Schofield resigns as treasurer. 60. HSC minutes, 30 May 1917. 61. W 20 Jul 1918; HSC minutes 10 Sep 1918; 15 Jul 1919; W 28 Jul 1919. 62. W 10 Jun 1918: 28 June 1919. 63. HSC minutes 26 Jan 1919, Feb 12 1919, 28 Feb 1919. 64. HSC minutes 26 Jan 1918 ; 19 Jan; 24 Mar 1919, 27 May 1918. In conjunction with comrades Dawson and Fred Shaw I have addressed five meetings in the Colne Valley and Huddersfield. The meeting on Wednesday was held in St. George’s Square, Huddersfield. under the auspices of the Trades Council to protest against the Army Secret Document. It was record for this year’s outdoor meetings, but was easily eclipsed by the Sunday evening one on the same spot, when the following resolution was carried, as also at Honley, the fighting centre of the Colne Valley division:- “That this meeting of Huddersfield workers condemns the Government’s failure to carry out its schemes of reconstruction, and thus to provide useful work for the unemployed;“Furthermore, expresses its disgust at keeping in prison the conscientious objectors, the Clyde strike leaders, and other champions of labour; at the continuance of conscription, the increasing intervention in Russia and Hungary, the brutal peace terms imposed on the German workers, and the issuing of the Army Secret Document of espionage on the soldiers to find out those willing to break strikes and generally to blackleg on the workers of the world; “Resolves, therefore, to use its influence inside the Trade Union movement to support the N.U.R. if the latter summons a conference of all unions with the object of carrying out a general strike on the above issues; and further pledges itself to support a general unofficial strike if the Trade Unions fail the rank and file at this critical juncture in the history of the world and the world’s workers.” Efforts are being made to build up a network of Workers’ Committees and independent educational classes in conjunction with the Central Labour College in Yorkshire, Lancashire, S. Wales, and Scotland must look to their laurels now that the dalesmen of Yorks are on the move. For the second time the Conle Valley in particular means to make history. 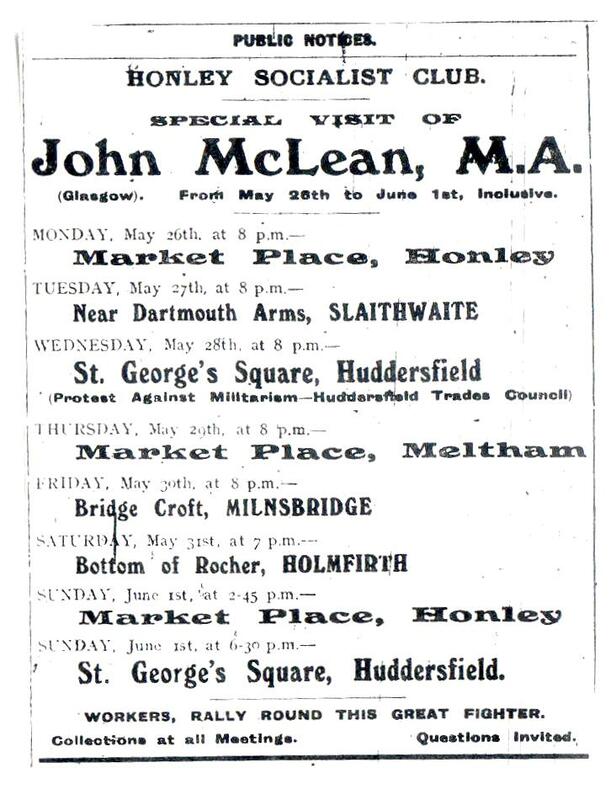 J. MACLEAN’; (Transcription: Ted Crawford; HTML Markup: Brian Reid;Copyleft: John MacLean Internet Archive (www.marx.org) 2007); Nan Milton, John Maclean (Pluto Press 1973) p.206; 9 Aug 1919; Attempts were also made to book Sylvia Pankhurst of the Workers’ Socialist Federation and William Paul of the SLP when they were in the area, HSC minutes 20 May, 27 Aug 1919. 66. W 17 May 1919, HSC minutes,20 May 1919, ‘the Greenfield Affair’; 6 Jun 1919, 20 Apr, 8 Jun, 6 Jul 1920,BSP. George Ebury was a former Heckmondwike carpet designer and councillor. As BSP organiser he had been arrested at the “Battle of St George’s Square” in Glasgow in January 1919. Weller op.cit.p.45. In 1921 as Yorkshire CP organiser he addressed a large crowd at a Huddersfield CP meeting. Worker 14 May 1921. 67. HSC minutes,23 Jan 1921;W 16 Apr 1921;HSC minutes 11 Feb 1923, the Communist Review was still being taken in 1927, along with the Sunday Worker HSC minutes 13 Feb 1927. 68. HSC minutes,15 Jul, 28 Oct; 21 Mar,25 Apr 1922 Daily Herald. 69. HSC minutes 31 Dec 1922; 22 Jan, 19 Feb, 16 Apr, 13 May 1924. 71. HSC minutes 16 Sep 1924; 27 Oct 1925; Huddersfield Labour Party minutes 4 May 1926. 72. HSC minutes,7 Aug 1925,8 Apr 1926; 31 May 1926; 11 Nov 1926, reference to Birdwell also in 16 Jan 1927; 16 Aug 1926; 13 Oct 1925; 10 Nov 1925. 73. HSC minutes,8 May 1926; CVLP 4 minutes, 7 Sep 1925.